Follow all the download instructions below. Click on “calibrate robot” and go on with the manual “robot calibration” in section “manuals” for details. Click on “Move & All Servos on”. This will switch all servos on. Your robot should move in its basis position, if you calibrated it before. If you did not calibrate it, it can move to any position. Click on “All Servos off” in order to prevent breaking of the robot. Use the sliders to move servos of the robot. Use “next normal speed” in order to go the the next step of the movement you want to create or to create a next step. Use the sliders again to set a new position of the robot. 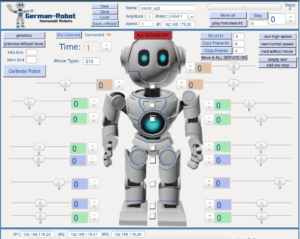 Use “Move all” to make the robot perform all steps of your program. Open livecode and then open the file above in livecode. Wenn man dort auf Download klickt, wählt man die ‘Community Edition’. Ich versuchte es unter OSX Sierra (10.12.3) mit den LiveCode Versionen 8.1.2, 8.1.3-rc-1, 9.0.0-dp-4, hatte allerdings bei allen das Problem, dass alles Labels mit Ausnahme von ‘Calibrate Robot’ und ‘All Servos off’ nicht lesbar sind, weil der Font die selbe Farbe wie der Background hat. Auf Windows klappte es dann. Noch ein Verbesserungsvorschlag. Wäre es möglich, dass man die IP zum ausgewählten Robot auch ‘oben’ eingeben kann? ja ich hab auch schon gehört, dass die Schrift teilweise nicht angezeigt wird. Scheint ein Bug in Livecode zu sein. Evtl. klappts auch wenn man die Größe der Buttons ändert.